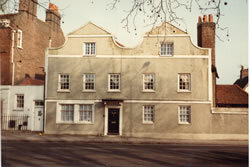 The Old Grange is at 2 Church Street, Hampton. It is a three-storey brick built-house dating from about 1650. The west front has a pair of Flemish type gables. In the 19th century, it was a private girls' school. G D Heath, Hampton in the Nineteenth Century, Borough of Twickenham Local History Society Paper No27, 1773 (2nd edition 1993).